I am loving Conspiracy: Take the Crown! I am tired of the dark zombies and vampires; encroaching evil upon all that is good and colorful bores me. I like vibrancy and fun stories. I like art you can feel and I don’t like to play with ugly, depressing cards - I have been known to out-right refuse to play a card in my deck if I don’t like the art even if the abilities would be beneficial. Four cards from this set immediately caught my eye, made me smile and day dream of the story within the picture. Jeering Homunculus: A blue miniature cyclops! I totally relate to this little guy! I hate crowds and sometimes my own self doubt shades me as irrevocably different. I think everyone has a short-blue-one eyed kinda day sometimes! 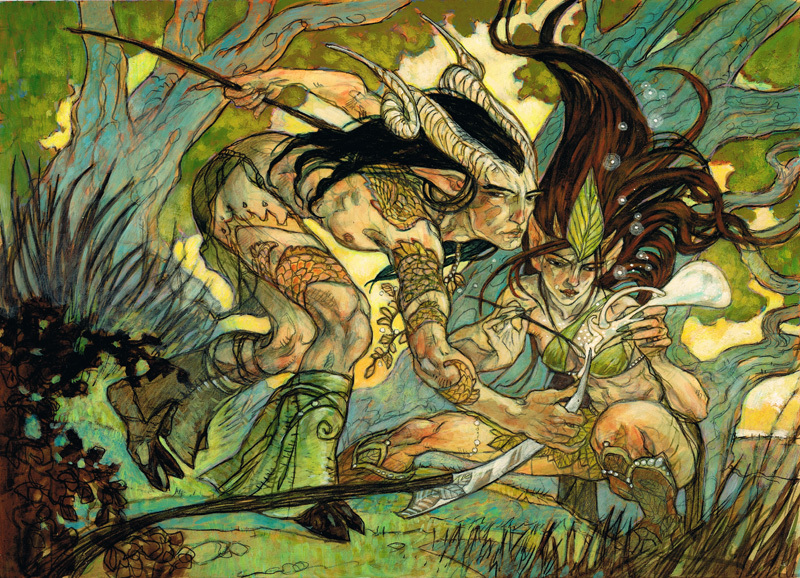 Lace with Moonglove: Reprint or not, I can't get enouch of Rebecca Guay’s art. Her stained glass, phantasmal cards always are a joy to look at; so delicate yet defined. I love her earthy pastels and dream like scenes. It leads me to wonder, what sort of deceit and trickery are these elves up to? With all the spells and weapons other MTG characters hold, these elves only need to look into their backyard! Show and Tell: I want to go to this academy! All sorts of fun running around! I am drawn back to our simple show and tells growing up, explaining to your classmates why what you brought is the coolest. Imagine if it was a giant glowing pastel being you were trying to control - haha! The medium is a beautiful iridescent and the flavor text just makes me second guess my college major! Well… maybe next month I will be able to narrow my card of the month down to just one card, for now I’m just too excited to see color in the game again!